Song of a Southern Wood Cricket (scroll down for explanation and additional recordings!). Southern Wood Crickets mature at the same time as Spring Field Crickets — May. They appear grayer due to numerous hairs covering their black bodies. Their wings are more brown than the wings of either Spring or Fall Field Crickets. In the mid-Atlantic States they can be found from late May through early August. 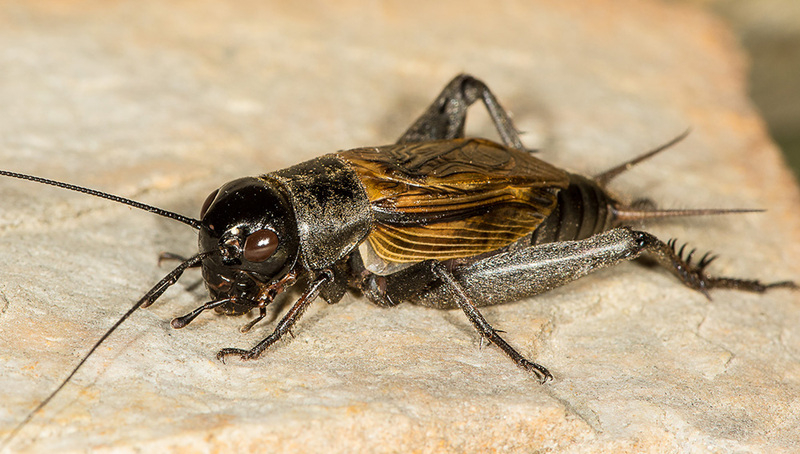 They occupy similar habitats as the Spring Field Cricket — burrows, crevices, cracks in walls, and around concrete sidewalks. Southern Wood Crickets can be found from central Ohio south to northern Florida and from central Nebraska east to the coast. Song: Southern Wood Crickets sound very similar to Spring Field Crickets, but sing at twice the rate. There are 4-5 chirps per second rather than 2, depending on the temperature. Each chirp is composed of 3-4 pulses, delieved too quickly for us to decern. The frequency of the song is at about 4.7kHz. If you listen carefully, Southern Wood Crickets often out number Spring Field Crickets in any given habitat. Sonogram of the Southern Wood Cricket’s song. Note that there are 4 chirps per second.